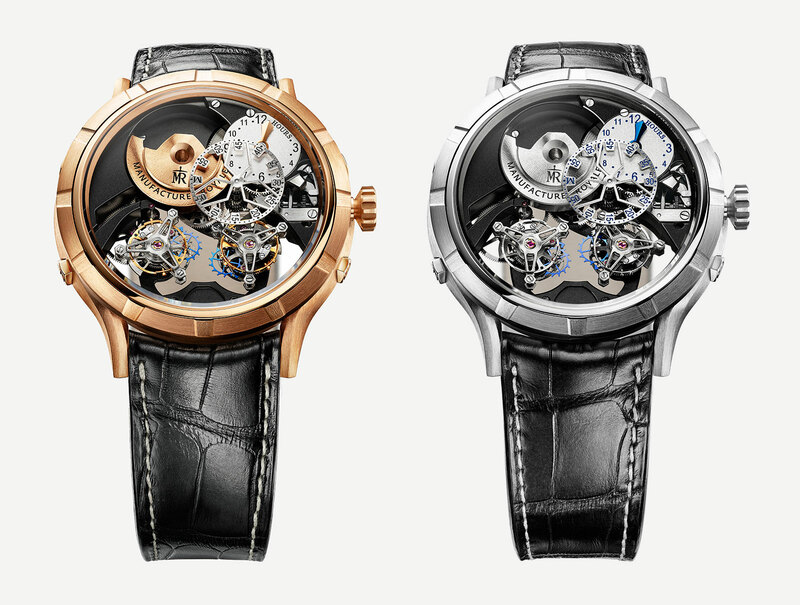 Twin flying tourbillons - one that goes rapidly and the other a conventional one-minute tourbillon. Micromégas is a short story by Voltaire about a giant who visits Saturn, which is populated by smaller folk. The Manufacture Royale 1770 Micromegas Revolution wristwatch also relies on dichotomy for novelty, with a pair of flying tourbillons on the dial rotating at vastly different speeds. The Voltaire connection continues with Manufacture Royale, a pocket watch factory that Voltaire helped set up in Geneva when he fled France, a somewhat fragile historical link that explains company name, while 1770 is the year the factory was established in the Swiss city. 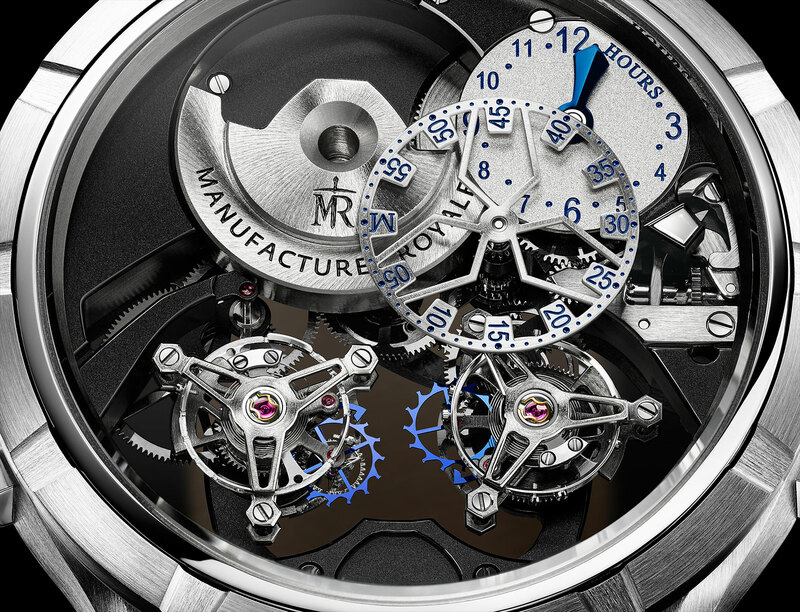 Like the brand’s other tourbillons, both on the Micromegas Revolution are flying. The tourbillon located at eight o’clock makes one revolution every six seconds, moving at a rapid clip. The other tourbillon is more ordinary, rotating once a minute. Both tourbillons are identically sized, so the six-second tourbillon is made of titanium for lightness, minimising the energy needed to maintain its quick rotation. 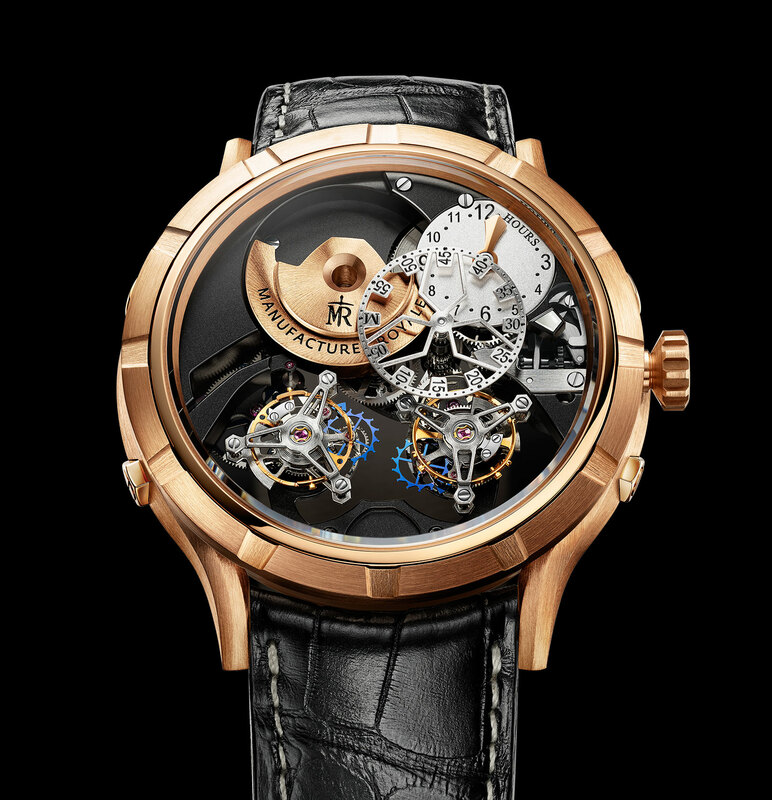 The one-minute tourbillon is brass. Time is indicated regulator-style, with the hours on a sub-dial at one o’clock and the minutes on an open-worked wheel just below. A micro-rotor visible at 11 o’clock winds the single mainspring, which has a 40-hour power reserve. Characteristic of the 1770 line, the case is a large 45mm in diameter, with a rounded case middle and short lugs screwed onto its flanks. It’s available in titanium or 18k rose gold. Available from Manufacture Royale retailers, the 1770 Micromegas Revolution in titanium (ref. 1770MR45.10.B) is SFr137,000, while the same in rose gold (ref. 1770MR45.08.B) is SFr162,000. Manufacture Royale's open-worked tourbillon is given a movement makeover with coloured galvanic treatment. Richard Mille recruited artist Kongo to spray paint the movement of the RM 68-01 Tourbillon Kongo, creating graffiti art for the wrist.